Dr. Bland against Abp. Armagh & al. Upon reading the Petition and Appeal of Nathaniel Bland Doctor of Laws, Deputy Surrogate and Commissary of the Court of Prerogative Royal and Court of Faculties in the Kingdom of Ireland; complaining of an Order of the Court of Chancery in Ireland, of the 14th of March last, made in a Cause wherein Hugh Lord Archbishop of Ardmagh Primate and Metropolitan of all Ireland was Plaintiff, and the Appellant Defendant; and praying, "That the said Order, for refusing the Prayer of a Petition, desiring, "That the Depositions of Richard Morgan and William Shiel, produced on the Behalf of the said Archbishop, to the Direct and Cross Interrogatories in the Appeal mentioned," might be quashed; and that Attachments might be granted against them; and that such Order may be made for the Appellant's Relief, as to the House in their great Wisdom shall seem meet; and that the said Archbishop, and Richard Morgan and William Shiel, may be required to answer the said Appeal:"
It is Ordered, That the said Lord Archbishop of Ardmagh, Richard Morgan, and William Shiel, may have a Copy of the said Appeal; and do put in their Answer or respective Answers thereunto, in Writing, on or before Tuesday the 6th Day of May next; and that Service of this Order on their respective Clerks in the said Court of Chancery be deemed good Service. Hodie 3a vice lecta est Billa, intituled, "An Act for granting to His Majesty the Sum of One Million, out of the Sinking Fund, for the Service of the Year One Thousand Seven Hundred and Forty; and for enabling His Majesty to raise the further Sum of Two Hundred Thousand Pounds, out of the growing Produce of the said Fund; and for granting to His Majesty the Sum of Twenty-one Thousand Pounds, One Shilling, and Eight Pence Half-penny, remaining in the Receipt of His Majesty's Exchequer, arisen by Sale of Lands in the Island of St. Christophers; and for the further appropriating the Supplies granted in this Session of Parliament." Hodie 3a vice lecta est Billa, intituled, "An Act for more effectually preventing fraudulent Qualifications of Persons to vote as Freeholders, in the Election of Members to serve in Parliament, for such Cities and Towns as are Counties of themselves, in that Part of Great Britain called England." Hodie 3a vice lecta est Billa, intituled, "An Act to continue several Laws threrein mentioned, for punishing such Persons as shall wilfully and maliciously pull down or destroy Turnpikes for repairing Highways, or Locks or other Works erected by Authority of Parliament for making Rivers navigable; for preventing Exactions of the Occupiers of Locks and Wears upon the River of Thames Westward, and for ascertaining the Rates of Watercarriage upon the said River; for preventing frivolous and vexatious Arrests; and for better securing the lawful Trade of His Majesty's Subjects to and from The East Indies, and for the more effectual preventing all His Majesty's Subjects trading thither under Foreign Commissions; and for limiting the Time for suing forth Writs of Certiorari upon Proceedings before Justices of the Peace, and for regulating the Time and Manner of applying for the same; for the better and more speedy Execution of Process within particular Franchises or Liberties; and for extending the Powers and Authorities of Justices of the Peace of Counties, touching County Rates, to the Justices of the Peace of such Liberties and Franchises as have Commissions of the Peace within themselves." Message to H. C. that the Lords have agreed to the preceding Bills. E. Selkirk against D. Hamilton, et è contra. It is Ordered, That the further Hearing of this Cause be adjourned till To-morrow; and that the Counsel be called in exactly at Twelve o'Clock. Dominus Cancellarius declaravit præsens Parliamentum continuandum esse usque ad & in diem Mercurii, secundum diem instantis Aprilis, hora undecima Auroræ, Dominis sic decernentibus. Hodie 3a vice lecta est Billa, intituled, "An Act for the more effectual Maintenance and Well-keeping of Staines Bridge and Egham Causeway, being the Highway from London to the West Parts of England." Colonel Johnston to enter into Recognizance for Dr. Bland. The House being moved, "That Colonel John Johnston may be permitted to enter into a Recognizance for John Bland Doctor of Laws, on account of his Appeal depending in this House; he being in Ireland:"
It is Ordered, That the said Colonel Johnston may enter into a Recognizance for the Apellant, as desired. The House (according to Order) was adjourned during Pleasure, and put into a Committee upon the Bill, intituled, "An Act for the Increase of Mariners and Seamen, to navigate Merchant Ships and other Trading Ships or Vessels." Ordered, That the Hearing of the Cause wherein Dame Ellis Aylmer is Appellant, and Robert Reed & al. are Respondents, appointed for To-day, be put off till To-morrow Sevennight. 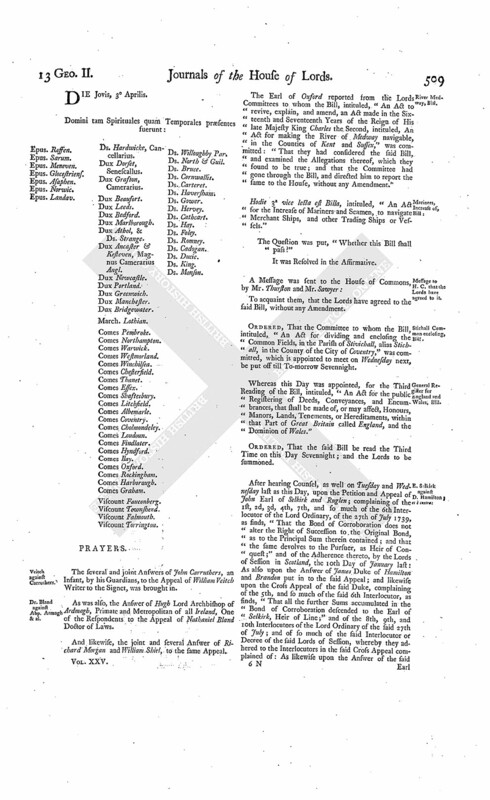 The Order of the Day being read, for the House to be in a Committee on the Bill, intituled, "An Act for amending and enforcing the Laws relating to Rogues, Vagabonds, and other idle and disorderly Persons; and for reducing the same into One Act of Parliament; and also for amending the Laws for erecting, providing, and regulating, Houses of Correction:"
It is Ordered, That the House be put into a Committee thereupon, on Monday Sevennight. E. Selkirk against D. Hamilton; et è contra. It is Ordered, That the further Hearing of this Cause be adjourned till To-morrow; and that the Counsel be called in at Twelve o'Clock. Dominus Cancellarius declaravit præsens Parliamentum continuandum esse usque ad et in diem Jovis, tertium diem instantis Aprilis, hora undecima Auroræ, Dominis sic decernentibus. The several and joint Answers of John Carruthers, an Infant, by his Guardians, to the Appeal of William Veitch Writer to the Signet, was brought in. As was also, the Answer of Hugh Lord Archbishop of Ardmagh, Primate and Metropolitan of all Ireland, One of the Respondents to the Appeal of Nathaniel Bland Doctor of Laws. And likewise, the joint and several Answer of Richard Morgan and William Shiel, to the same Appeal. The Earl of Oxford reported from the Lords Committees to whom the Bill, intituled, "An Act to revive, explain, and amend, an Act made in the Sixteenth and Seventeenth Years of the Reign of His late Majesty King Charles the Second, intituled, An Act for making the River of Medway navigable, in the Counties of Kent and Sussex," was committed: "That they had considered the said Bill, and examined the Allegations thereof, which they found to be true; and that the Committee had gone through the Bill, and directed him to report the same to the House, without any Amendment." Hodie 3a vice lecta est Billa, intituled, "An Act for the Increase of Mariners and Seamen, to navigate Merchant Ships, and other Trading Ships or Vessels." 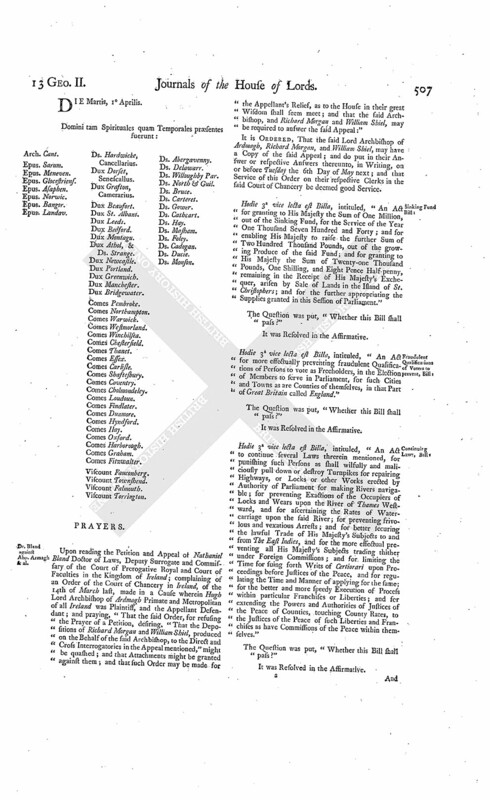 Ordered, That the Committee to whom the Bill, intituled, "An Act for dividing and enclosing the Common Fields, in the Parish of Stivichall, alias Stichall, in the County of the City of Coventry," was committed, which is appointed to meet on Wednesday next, be put off till To-morrow Sevennight. 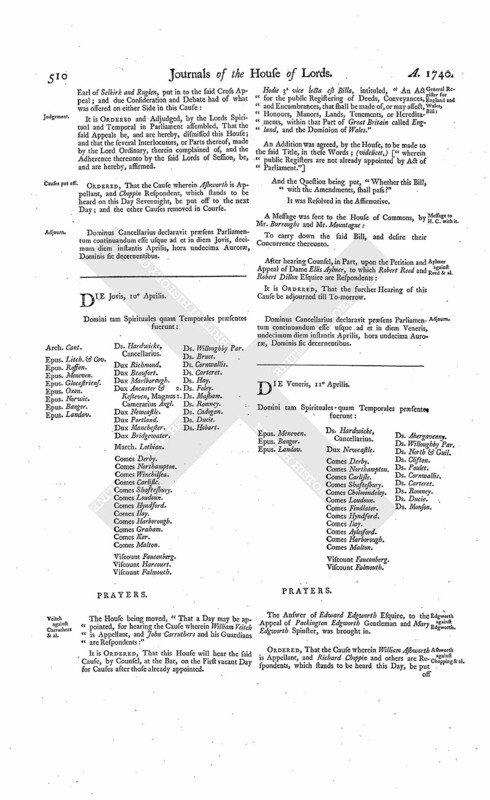 Whereas this Day was appointed, for the Third Reading of the Bill, intituled, "An Act for the public Registering of Deeds, Conveyances, and Encumbrances, that shall be made of, or may affect, Honours, Manors, Lands, Tenements, or Hereditaments, within that Part of Great Britain called England, and the Dominion of Wales." Ordered, That the said Bill be read the Third Time on this Day Sevennight; and the Lords to be summoned. It is Ordered and Adjudged, by the Lords Spiritual and Temporal in Parliament assembled, That the said Appeals be, and are hereby, dismissed this House; and that the several Interlocutors, or Parts thereof, made by the Lord Ordinary, therein complained of, and the Adherence thereunto by the said Lords of Session, be, and are hereby, affirmed. Ordered, That the Cause wherein Ashworth is Appellant, and Choppin Respondent, which stands to be heard on this Day Sevennight, be put off to the next Day; and the other Causes removed in Course. Dominus Cancellarius declaravit præsens Parliamentum continuandum esse usque ad et in diem Jovis, decimum diem instantis Aprilis, hora undecima Auroræ, Dominis sic decernentibus. 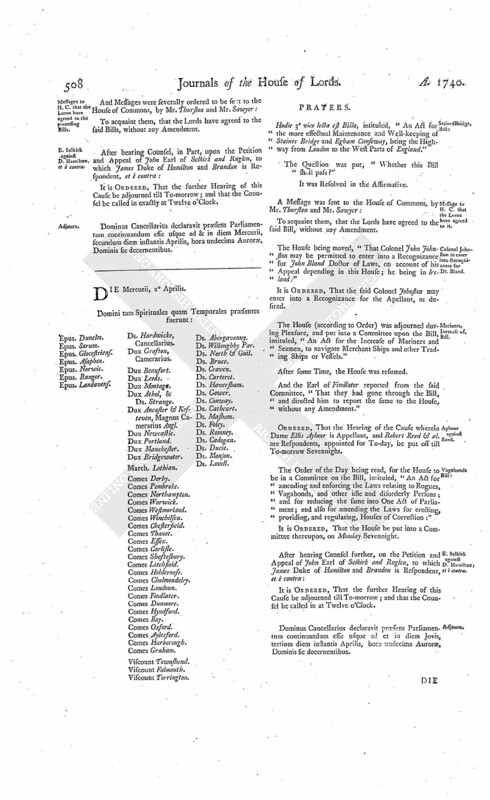 The House being moved, "That a Day may be appointed, for hearing the Cause wherein William Veitch is Appellant, and John Carruthers and his Guardians are Respondents:"
Hodie 3a vice lecta est Billa, intituled, "An Act for the public Registering of Deeds, Conveyances, and Encumbrances, that shall be made of, or may affect, Honours, Manors, Lands, Tenements, or Hereditaments, within that Part of Great Britain called England, and the Dominion of Wales." Dominus Cancellarius declaravit præsens Parliamentum continuandum esse usque ad et in diem Veneris, undecimum diem instantis Aprilis, hora undecima Auroræ, Dominis sic decernentibus.